Ready. Set. Summer! with Michigan Tech Recreation. Open to the community, make plans for summer fun in the pool, ice arena, multipurpose room and trails. Looking for way to beat the heat or the rainy day blues? Open hours are available for public swimming, skating, indoor track running, basketball and volleyball. Single day passes and group rates are available. You can also take advantage of the great trail system for a family ride or aerobic adventure. 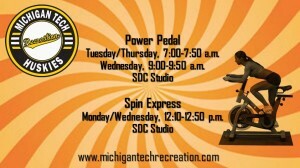 For more information, visit www.michigantechrecreation.com. See you at the SDC! Whether you’re a novice rider or a serious cyclist, Spinning has you covered! You make your spin workout is as intense as you want it to be. This summer, we offer 2 great spin class options – Power Pedal and Spin Express. Power Pedal runs Tuesday/Thursday, 7-7:50 a.m., and Wednesday, 9-9:50 a.m. Spin Express is great if you’re short on time! The class meets Mondays and Wednesdays from 12:10-12:50 p.m. Spin class punch cards are available online or at the SDC ticket office and can be used toward either class. Daily passes are also available. For more information, visit Spin. Commit to be HuskiesFit this summer!